Below you will also find the references I prepared for class. We touched on ideas of online identity, personality, and a lot on the tension between what can or cannot be done effectively in fully online classes. We heard of robotics and examples of possible digital facelifts (electronic textbooks? Government forms?). 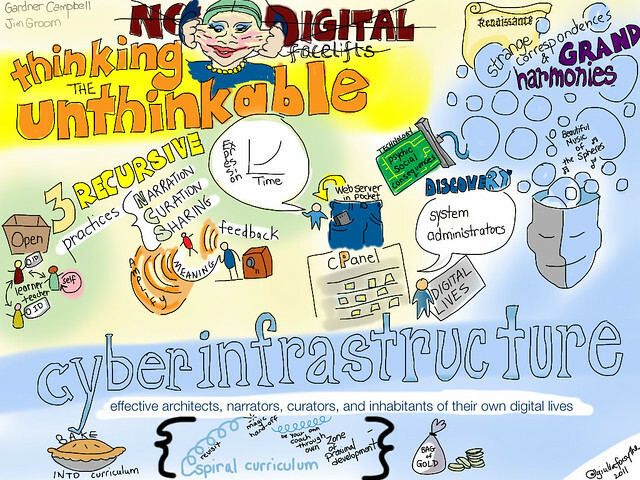 A Personal CyberInfrastructure (from EDUCAUSE Review). Higher education almost completely ignored Marshall McLuhan’s central insight: new modes of communication change what can be imagined and expressed. “Any technology gradually creates a totally new human environment. Environments are not passive wrappings but active processes. . . . The ‘message’ of any medium or technology is the change of scale or pace or pattern that it introduces into human affairs.” Print is not advanced calligraphy. The web is not a more sophisticated telegraph. It’s a radar…what part of that do you not understand? “What sticks with me is the discussion about the old balloon system being replaced by the radar. I really love the kinetic typography post by Tim Owens and was hoping to try the medium myself. I did some hunting and found his accompanying post (http://www.timmmmyboy.com/2011/01/bag-of-gold/) and the one that inspired him (http://www.robnyland.com/blog/2011/01/15/ds-106-assignment-1-30-second-story/) to discover that it was made with an Adobe software package called After Effects (http://www.adobe.com/products/aftereffects.html). Do you know whether there any ds106 tutorials from wayback (a repository perhaps?) where I might find instructions on how to do a kinetic typography vid? We have the Adobe suite on campus here, so I’m thinking I might “play” with it, but AE (and digital typography) looks as if it’s just a tiny piece of an otherwise very sophisticated and likely hard to use program. So, do you (or anybody) have a quick and dirty tutorial for someone wanting to create using kinetic typography? Thanks! We don’t have a repository of tool tutorials, at best a search on the site might hit something, but this was a specialized effort. If you go back to Tim’s post, down in the comments I think he listed some resources… I would suggest just contacting him. My sense was it is not trivial. You might get close to some of the feel with prezi. well i think cyberinfastructure is a kind of a new way to help some of us to be what we’ve dreamt of being for long. this is because lets say i wanted to be a voice to be heard but im an introvert, the internet will help me since its going to be like a shield covering me from my audience, and as in blogging too makes it more easier with it.